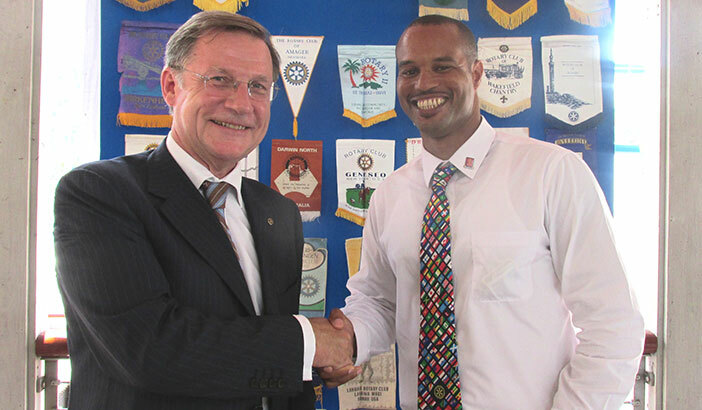 Henry Creque, President of the Rotary Club of Tortola, welcome the newest Rotarian: His Excellency Governor John Duncan OBE. During the weekly luncheon of the Rotary Club of Tortola His Excellency, The Governor John Duncan, OBE, was inducted into the Family of Rotary by the Club’s President Henry Creque. Rotary Assistant Governor Delma Maduro gave a very impressive introduction for Governor Duncan of his achievements and diplomatic career. For many years it has been a tradition to invite the respective Governor to become an honorary member of the Rotary Club of Tortola. The Governor thanked the President and Rotarians for the invitation to become a member and assured his support to the goals of Rotary. He said he is very much looking forward to his term in the BVI and crossed reference to his last assignment in the Falkland Islands, stating that while their population is only about 10% of that of the BVI, they to have a large number of Nations living there, which he estimated to be about 40-50, compared to the BVI with over 100 different Nations.